Yesterday, I cranked the air up. Today, I am wrapped in blankets playing the "is it time to turn the heat on yet?" game. Mother Nature is so fickle this time of year, isn't she? For days like today, hot tea and soup are my bff. I usually save myself a bowl of leftover soup in the fridge from dinner to eat for lunch during the week, but I didn't have any in there today to warm my bones. 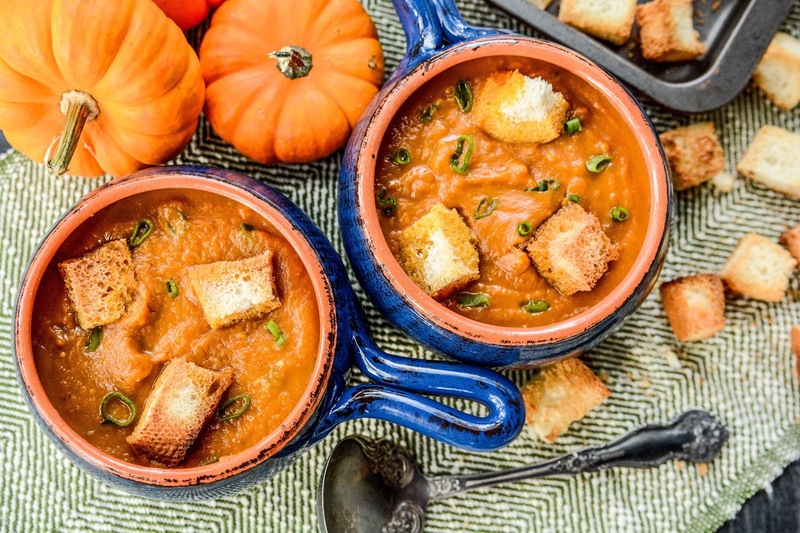 What I did have was some canned pumpkin leftover from my brioche bread pudding I featured earlier this week, so I decided to use it up in this homemade Pumpkin Coconut Soup recipe from Golden Blossom Honey. It's a creamy soup, but not heavy since it doesn't include heavy whipping cream, but coconut milk instead. I had some French bread that was getting a bit old, so I cubed it up and tossed it into the oven for some homemade croutons, which paired wonderfully with the soup. I love bread, so I am a sucker for any kind of soup that I can put croutons in. It just makes the soup that much yummier, don't you think? With Thanksgiving just over a month away, this would be a great addition to your holiday menu. It's a lovely seasonal recipe that pairs well with all of the holiday trimmings. 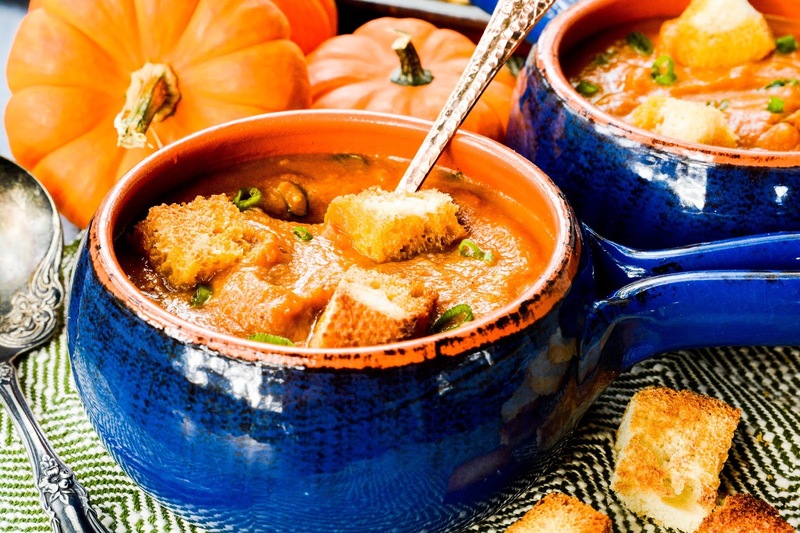 Do you eat soup year round, or just when the weather turns chilly? Welcome back, Indah! I hope NYC has started to get their fall colors in so you can enjoy them once again while back in the States. We've cut out the white bread too for the most part, but I will buy a baguette once in a blue moon for croutons or bread pudding. What a gorgeous colour combo, deary, with those cute dishes and those orange pumpkins! Not sure I'd eat it, I don't do coconut in savoury dishes, but it does look fragrant and warm! My heat went on today and Mariah even said it snowed at her college today :( Thankfully, it didn't come up here, so all we got was cold and rain. This crap better go away before next weekend as I am treating my mama to a concert for her birthday and it's outdoors. Nothing would be worse than standing out in the rain or snow for several hours listening to music. Sure the perfect color for the season indeed. Haven't had soup in decades, big surprise huh?, but the weather sure is fickle here too. No matter what time of the year it is, I always love soups. Thank you for this recipe. Would love to try it out!! I eat them year round too. I love me some soup! I don't think I've ever had this flavor combination before. It sounds really tasty. I have a feeling this is going to be a new family favorite. I've never had it before either, but it was surprisingly delish! I was unsure about this one, but ended up eating 2 bowls of it. From the title itself this dish sounds really delicious. I have never tried to make this soup flavor but it looks so easy, yummy! I love that it's a lighter version with coconut milk. It really is perfect for Thanksgiving! The coconut milk is the one ingredient that will make this soup really flavorful. I am going to add this to our meal plan and pinning the recipe in my pinterest soup recipes board. Oh boy I would love this! My sister is having 3 family member's birthday celebrations at her house coming up. Usually she makes soup this time of year. Maybe I could add, and make this one. I am so happy it is soup season. I think pumpkin and coconut would make a great mix for a soup. What a unique ingredient combination for a soup! Sounds delish.